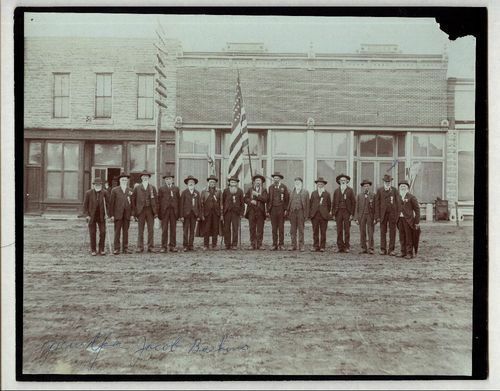 This sepia colored photograph shows members of Grand Army of the Republic (GAR) reunion in front of McCarthy Hardware store in Formoso, Kansas. Nina M. Yerian donated the photo to the Historical Society in 1971. The donor identified Jacob Baskins (identified by a blue check mark) as "grandpa" and indicated that the location could be Formoso or Mankato. At that time, Jewell County GAR posts included the Jim Lane in Mankato, the Ionia in Ionia, and the S.R. Deach in Jewell. A patron has since identified the location as Formoso and the building on the left as T. H. Shedden's Drug Store and the building on the right as the Formoso Mercantile. The patron identified the men as (from left to right): Jamison Wright, Edgar Walker, Joe Andrews, B. F. Clark, John Hamilton, John L. Worley, Josephus Canfield, William Patrick, John Clawson, Phyletes Axtell, N. M. Hyde, Julius Robinson, Henry Livingood, Jacob Baskin, and Mr. Johnson. The patron identified the date as 1900. The Grand Army of the Republic was a Union veterans organization that established local posts across the United States at the end of the Civil War.